I always wanted to have the text engraved effect on button control, finally able to do it using css properties. Have a look at the following screenshot. Add the text-shadow attribute to your css classname. Unfortunately, only Google Chrome browser supports it. But I found this link to implement it using jquery. I like this simple tool to synchronize two folders. It’s very useful for folder backups. Got some google wave invites, If anybody interested please send me an email (ludmal@gmail.com). Twitter to update your facebook status. It’s easy. Goto http://apps.facebook.com/twitter/ , add the application to your facebook. Click on the link “Want Twitter to update your Facebook status? ”, That's it! Most of the developers like to develop new features rather than fixing bugs. We tend to postpone bug fixing and eager to start developing new features. In general, it’s easy to fix a bug right away than fixing it later. The reasons are -- code is fresh in our minds than to fix it later, we might have forgotten the code if we keep it for later. Hence going through the code again is time consuming. Moreover, having lots of bugs is definitely not a healthier approach. Another reason is, it’s hard to predict the time to fix a bug, but easy for a new feature. To keep your project schedule always inline and accurate fix bugs right away before start developing another new feature. Life is a process. So be consistent in what ever you do. We tend to forget how to live and hence we are missing best things in our lives. The most difficult thing in life is to be consistent. Its easy to start but difficult to follow up. Eventually, we'll still be on the first page. 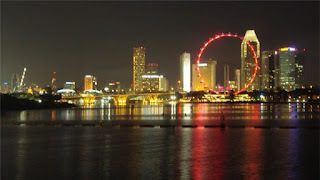 This is a snap I took during a visit to Singapore Flyer. If you are looking for a simple and quick solution for your programming problems please visit, www.aspnetr.com , Its still in beta and will take another week for a fully functional site. The main idea behind this site is to give a spot on solution for all your .net related matters and most preferably ASP.NET. Download the following dll to get the country by passing IP address. This is a .NET 3.5 library that retrieves the country information for an Internet Protocol version 4 (IPv4) Address, by extending the System.Net.IPAddress class. Then simply add the code in page load method. Recently I worked on a Dashboard Project which shows Sales, Invoices, ATB and DSO info. Initially I started with Dundas Charts but later we changed to a nice 3D looking charts called "Fusion Charts". Of course Dundas Charts was good enough but I was looking for a better 3D look, therefore I had to switch to Fusion charts. It was very simple but powerful and we use XML as Data Source. If you are looking for a nice 3D graphs for your project you better have look at this. Life is so easy with Google and Apple products. Almost all of my official and personal activities in daily life supports by a google or an apple product. I use gmail as my primary emailing software from last 4 years, the experience was amazing. I use Google Gmail, Tasks, Calendar, Reader, Notebook, Doc, Google sites, Chrome and Google News, almost everyday. And Apple on the other hand with IPod and ITunes. I recently bought a IPod nano and the experience was so amazing compare to the earlier IPod version.